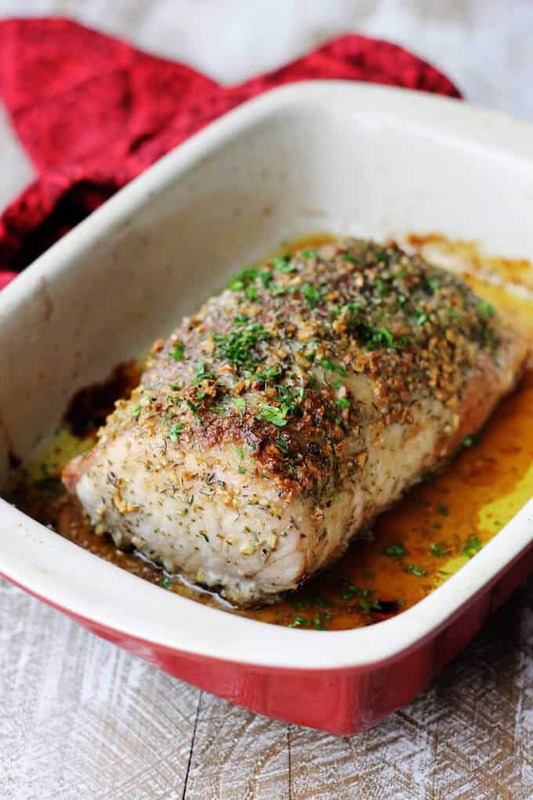 Brown Sugar Pork Loin with Garlic & Herbs is one of the easiest and most delicious dinners you can make that will surely have people coming back for seconds. 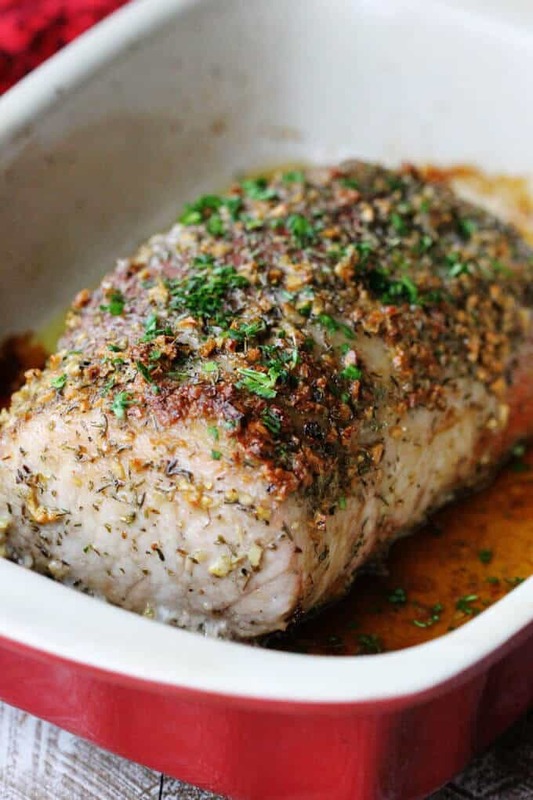 This Brown Sugar Pork Loin with Garlic & Herbs is really fantastic! 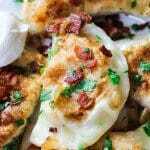 It has this amazing sweet, garlicky topping which encrusts a juicy, succulent meat. 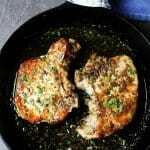 Because my recipe for Brown Sugar Pork Chops with Garlic & Herbs is tremendously popular I decided to give this recipe a twist and make the whole loin with the very same ingredients. And the result is equally as outstanding. When I told my husband that I want to make this loin for the blog, he was excited but also a little concerned. He said that pork loin is tricky because it has a tendency to dry out (Mind you, this awareness isn’t coming from someone who actually cooks, but rather from someone who just loves to eat meat). Well, I totally understand that concerns, but if you follow my instructions, I promise that, you will end up with a super juicy and flavorful meat. 3 tablespoon of kosher or himalayan salt. You will place your loin in the ziplock bag and then submerge it in your brine. Then place your bag into a bowl and leave it in the fridge for at least half hour. 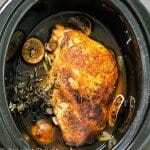 In the meantime you can prepare the brown sugar & garlic mixture and heat up your oven. After the bringing process is completed you can just place the loin into a baking dish, generously sprayed with cooking spray, and rub the brown sugar garlic mixture all over it. Pop it into the oven and the dinner will be ready in about 40-45 minutes. I took mine out when the internal temperature was 145 F and let it rest for 10 minutes. Large cuts of meat increase the temperature when resting, so you don’t want to overcook your meat. 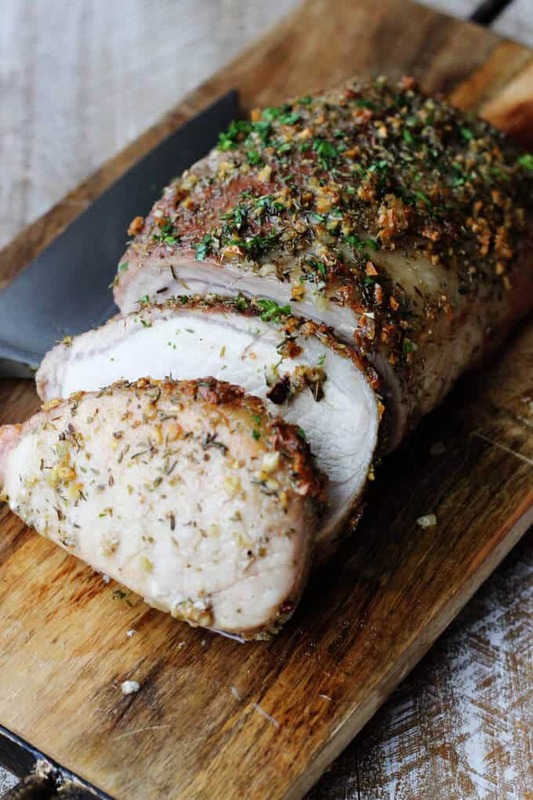 Whatever you chose to serve this Brown Sugar Pork Loin with, I can assure you that your family will certainly be raving about the meat. Enjoy! To prepare the brine, dissolve salt in one cup of hot water and then add remaining 2-3 cups of water and let it cool to room temperature. To speed up the process you can add few ice cubes. Add pork loin to the zip lock and pour over the brine. Place in a bowl and then in a fridge for at least a half an hour. In the meantime, heat up you oven to 375F and prepare the marinade. Add minced garlic, brown sugar, herbs and olive oil into a bowl and mix to combine. Once the brining process is completed, pat the meat dry. Spray your baking dish with cooking spray and place your pork loin in the middle. This is how you do pork! This looks so good for a delicious dinner! I don’t think so. I’m not sure where you get this number from but probably taken into consideration the brine, which should not be. It just tenderizes the meat. 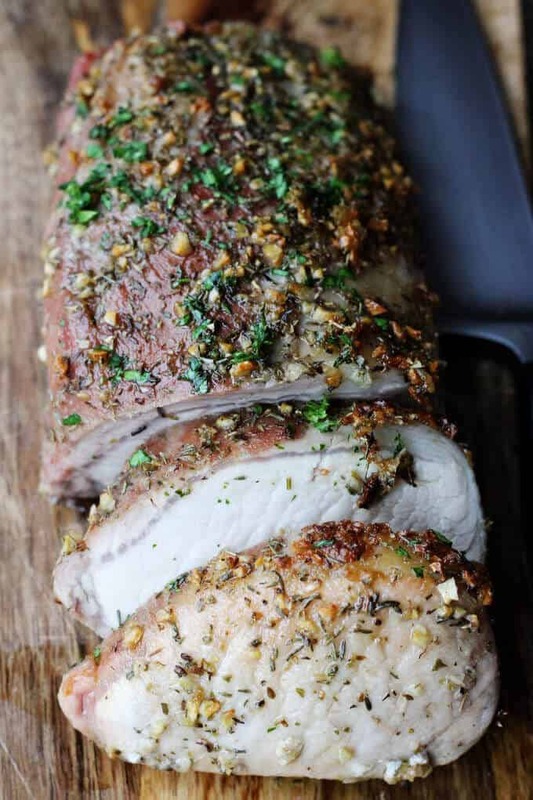 That pork loin looks so moist and juicy! I haven’t brined a whole loin yet! Great idea! If you ask any of my five daughters what the secret ingredient to (almost) everything is, they will tell you “brown sugar.” (I’ve taught them well.) 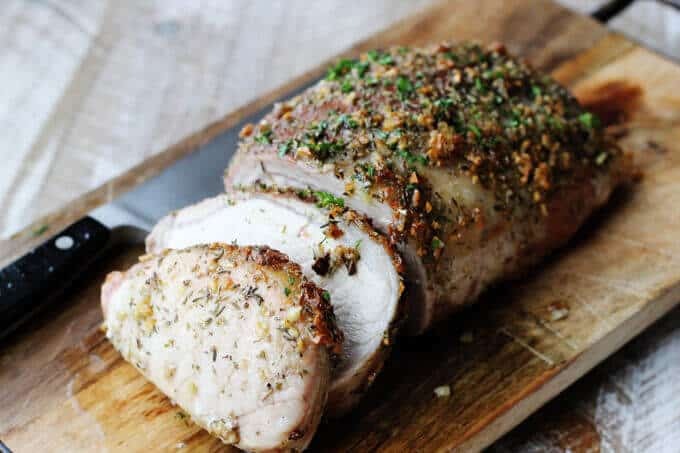 Seriously though, this looks like a great preparation, I’ve never brined a pork loin, but I will definitely give it a try next time we have one. Thank you! 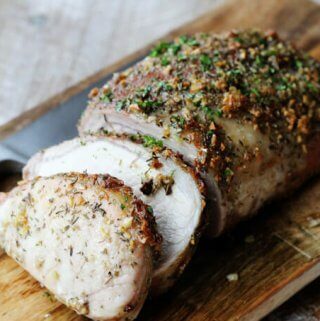 I’m a little skeptical about making a pork loin like this, but you make it look easy and enjoyable! 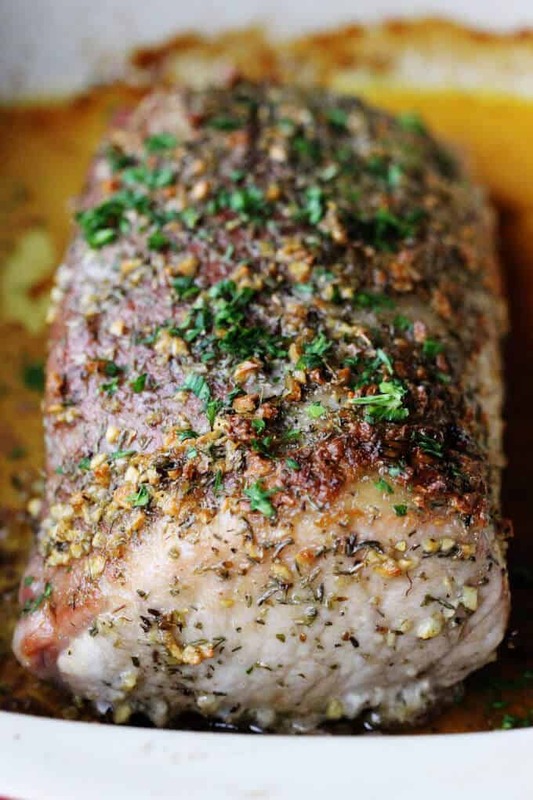 Pork loin is one of my favorite lean proteins so flavorful and easy to make. The brown sugar really goes well with pork. Lovely recipe! Oh my goodness, this looks SO delicious. The texture and moisture level – second to none. I love flavorful infused dishes like this!